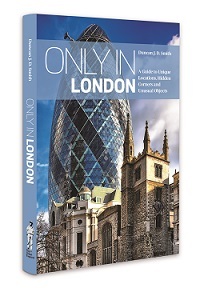 Only in London is one of a series of guidebooks written by Duncan J.D .Smith who is known as ‘The Urban Explorer’. The author is a travel writer, historian, and photographer who had worked for many years in the publishing industry dealing with travel writers‘ books. In 2003, Duncan decided to start writing and publishing his own guides which have seen him writing books about Berlin, Budapest, Cologne, Edinburgh, Hamburg, Munich, Paris, Prague, Vienna, and Zurich. This particular book finds the author exploring some of the hidden gems of London and searching for “Unique Locations, Hidden Corners and Unusual Objects”. The intention of the author “is to enable readers to acquaint themselves not only with the surviving treasures of old London but also to savour the delights of the new”. Unusually, the author uses postcodes to create the different sections of the book with each section including a series of articles that range from The Ruins of Roman Londinium to Banksy’s Falling Shopper. In the last decade or so, there have been a large number of guidebooks that have followed a similar format exploring Secret or Hidden London. However, this book is more concerned about telling the ‘stories’ behind the location or object. Therefore we have a series of imaginative titles such as Pickled Toads and Dodo Bones, Sustenance in Strange Places, The Horse Hospital and Other Galleries, Foundlings and the Messiah, Bolt-holes for Bookworms and Walking on Greta Garbo. Some articles are themed, so the reader can look for Hawksmoor’s Rockets, go on a Historic Pub Crawl, find Medieval Church Survivors, explore Theatreland and enjoy Waters, Walks and Gardens Green. In many of these ‘stories’, the author considers the historical, cultural and social context to understand a building, object or location. It is this level of detail that takes this book to a different level in comparison with its competitors. The book includes maps and colour photographs to illustrate particular aspects of the narrative that provide the reader with a visual as well as a written reference point. The book also includes a useful list of opening times and a bibliography for those readers who would to take their London related reading further. Only in London is a fascinating introduction for the first time visitor or the experienced London explorer, the author manages to be authoritative without being overly academic and takes the reader on an enjoyable wander through some of London’s lesser known sights and provides some interesting fresh perspectives on well-known sights. The author impressively weaves the past and present together to give a sense of change in the capital but also highlights the sense of continuity in London. Tags: Duncan J. D. Smith (The Urban Explorer), Foundlings and the Messiah, Hawksmoor’s Rockets, Medieval Church Survivors, Only in London by Duncan J. D. Smith, Only in London by Duncan J. D. Smith (The Urban Explorer), Pickled Toads and Dodo Bones, The Ruins of Roman Londinium, Walking on Greta Garbo. By londonvisitors2014 in London Book Review - Non Fiction on December 5, 2017 .